1. With a clip in the Magix timeline selected, in the Effects tab, choose Extra effects > Plug-ins, then click FilmTouch 2 (or FilmTouch 2 Pro if you have that). The FilmTouch main window will then appear, as shown below for FilmTouch Pro. See the easy steps described in the left side of the illustration. The window for the regular version of FilmTouch is similar but only has three controls. FilmTouch 2.0 has two types of presets -- Effects Browser presets and Section presets (Pro version only). This is the most powerful and visual way to access presets and is where HUNDREDS of film look effects presets are located. (There are 200+ presets in FilmTouch 2.0, or 500+ in the Pro version.) 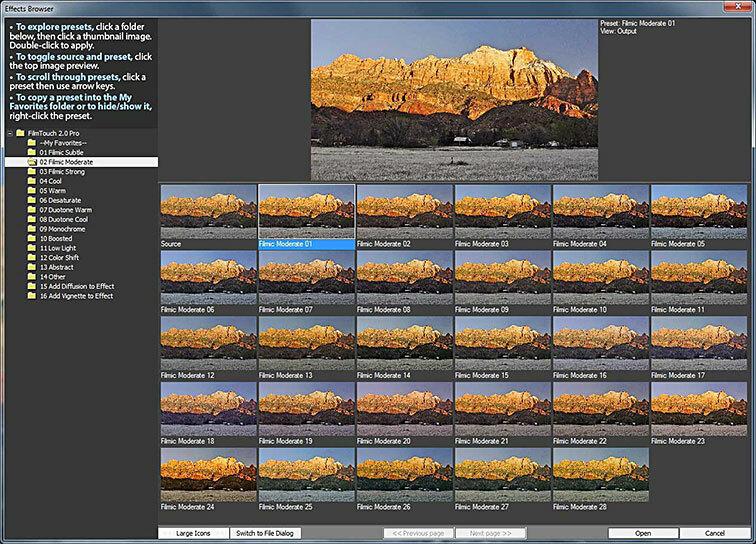 Click the Click here to load a preset... button at the top of FilmTouch 2.0 to open a large Effects Browser window to visually choose/compare pre-made effects. The Effects Browser is shown below. To save your own custom presets in the Effects Browser, use FilmTouch controls to set up a desired look, then click the Save button (disk icon) at the top of the main FilmTouch window. 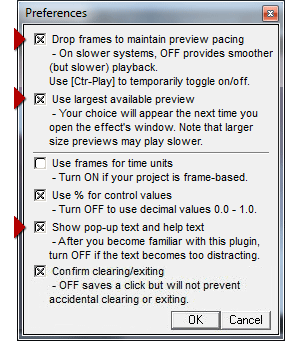 Unlike the Effect Browser presets, these change ONLY the controls in ONE section of FilmTouch Pro. Mixing presets from several sections is a quick and easy way to try hundreds of fresh film look effects and variations. To browse through section presets, click the blue FX folder icon at the top right side of any section. Scrolling your mouse through the choices will update the built-in preview instantly. Cool! Note: The FilmTouch 2.0 'regular' version has Mid Contrast, Gamma, and Mix with Original controls only -- the three most useful ways to tweak existing film look presets. All of the controls below are in the Pro version. IMPORTANT: As noted in the above section, to quickly try common settings in any section of FilmTouch 2.0 Pro, use the Section Presets menu at any section's top. Center. Position the shape within the image by dragging the center point. If Linear is selected, you can adjust its angle by moving the center point. For more precision, enter numerical values, such as to match the shape in two different dissolves.